Passion is Engrained Within Us. The Kice family has been working in the wheat flour milling industry for decades. “Bill” Kice was an experienced millwright and his sons Jack, Russell, and Jim learned the trade at a young age. Today Bill Kice’s grandchildren and Great grandchildren (third & fourth generation) are serving the milling industry using skills and knowledge passed down from their forefathers. 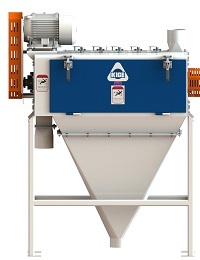 Kice Industries’ entrance into the equipment manufacturing and system design started with the Kice Multi-Aspirator® to clean grain prior to milling. The Multi-Aspirator® was designed by “Bill” Kice and is unique in that there are no moving parts and the removal of contaminates is done with air. Kice pioneered the use of pneumatic conveying in the flour milling industry by introducing positive displacement blowers to pressure convey products in small line sizes but large capacity. In addition to positive pressure conveying systems Kice became a leader in total mill pneumatics by converting bucket elevator systems to negative pneumatics. The first mill conversions from bucket elevators to negative pneumatics were completed in the 1950’s for milling companies in Michigan, Georgia, Oklahoma and Kansas. With the exception of the Kansas mill, these mills continue to operate today. Kice has development a complete line of industrial air equipment, which includes pneumatic conveying, grain cleaning equipment, environment and process dust control, and large volume air stabilization system. Kice produces some grain milling equipment, which includes roller mills, bran dusters, and even a specialized purifier. In 1992 Kice collaborated with Kansas State University to develop the Kice Shortflow® Unit flourmill. This unique milling flow originated and was patented by Kansas State University. The unique characteristic of the KSU milling flow is the reduced number of passages required to produce white flour. Companies that mill with the Kice Bran Finisher make finer flour, and more dough. The difference between our equipment and others’ can be seen in your bottom line. Using patented technology, our Bran Finisher recovers micro-traces of grain and turns it into salable product and revenue. When you mill with Kice equipment, you have a partner for the long haul. Our industrial products and systems are built to last, with durable parts we create ourselves. We can design, manufacture and assemble bran finishers and entire pneumatic systems specifically for your operation. It’s no surprise that virtually every milling plant in the country uses a Kice Bran Finisher to increase efficiency and profits.